Can Winter Coats Keep Child Car Seats from Working? Was Your Child Injured Due to Someone Else’s Negligence? A child has several disadvantages compared to an adult when it comes to avoiding personal injuries. Children are physically smaller and weaker, making them more vulnerable in car crashes and other accidents. Additionally, children often do not have the experience and reasoning skills necessary to recognize and avoid certain dangers. Still, though the world is a dangerous place, we expect product manufacturers and adults in general to take the utmost care to protect children from harm. Sadly, this is not always the case, as adult negligence commonly translates into child injuries which can affect the rest of the victim’s life. Any child injury can be difficult for a family, but an accident that results in a child’s catastrophic personal injuries or wrongful death is a devastating tragedy. 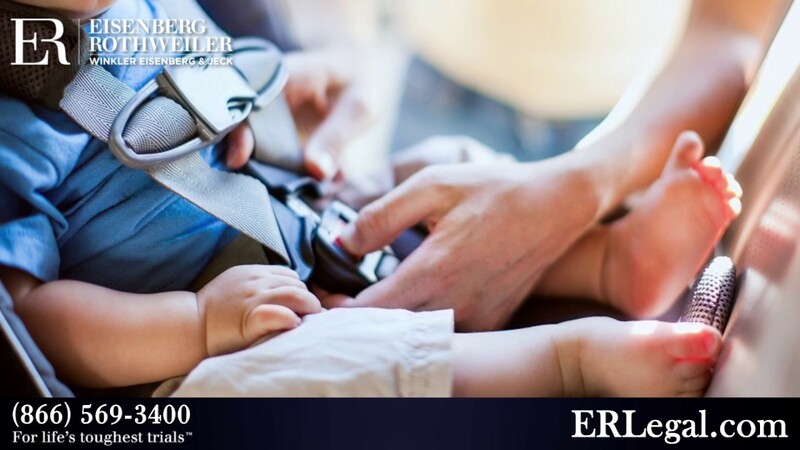 At Eisenberg, Rothweiler, Winkler, Eisenberg & Jeck, P.C., our attorneys offer aggressive, uncompromising representation to parents and families struggling with the aftermath of accidents involving children. A child injury lawyer from our firm can assist you in pursuing maximum compensation for injuries inflicted upon your child. We know how these situations affect families and the challenges a catastrophic child injury can create. That is why we work to recover compensation to secure your child’s future health and wellbeing as well as hold those responsible accountable for their actions. What are the Most Common Causes of Child Injuries? Children and infants are among the most vulnerable segment of any society, and therefore the most susceptible to injury. We aggressively pursue child injury lawsuits to protect our clients and to make the world a safer place for children. Among the most common causes of child injury are defective products, especially toys and other items intended for youngsters. Some product defects which may be harmless to an adult can cause catastrophic personal injuries to a child. However, manufacturers have a duty to create safe products or include warnings about the risk to children. If a company neglects this duty and your child sustains injuries, then you likely have grounds for a product liability claim. If your child was injured, do not delay in seeking legal advice, even if an insurance company tells you otherwise. Child injury claims are often different than most personal injury cases, and therefore may be subject to different time limits and other rules. Waiting too long could mean losing the right to file a lawsuit. Reach out to Eisenberg, Rothweiler, Winkler, Eisenberg & Jeck, P.C., as soon as you can. Are Child Injury Cases Different from Other Personal Injury Lawsuits? Children cannot file their own personal injury claims. By law, those under the age of 18 (who are not emancipated) are minors, and therefore cannot legally file a lawsuit for themselves. Instead a parent or guardian must work with a child injury lawyer to file a suit on the minor’s behalf. Parents typically must file a separate claim for medical bills. Generally, a child’s parent or guardian is responsible for his or her care, including medical expenses. This means that the child usually cannot collect compensation for medical treatment. Instead, the parent or guardian must file a separate personal injury claim for these damages. Children may collect compensation even if they are at fault for their own injuries. Young children are not expected to recognize dangers in the same way an adult would. Therefore, adults typically have a duty to provide more protection for children. For example, an adult should know not to wander onto someone else’s property and swim in an unattended pool. However, a child may not. For this reason, pool owners must have fencing to prevent accidental child drownings and pool injuries. If the owner fails this duty and a child injury results, the child can likely collect compensation. If a defective product or any other form of negligence caused injury to your child, we are here to help. Call (877) 638-0114 or contact us online to arrange a consultation with an experienced, caring child injury lawyer. We have offices in Philadelphia, Pennsylvania and Cherry Hill, New Jersey for your convenience. We offer free initial consultations and handle cases on a contingency fee basis. This means you do not pay us unless we get results for you and your child.